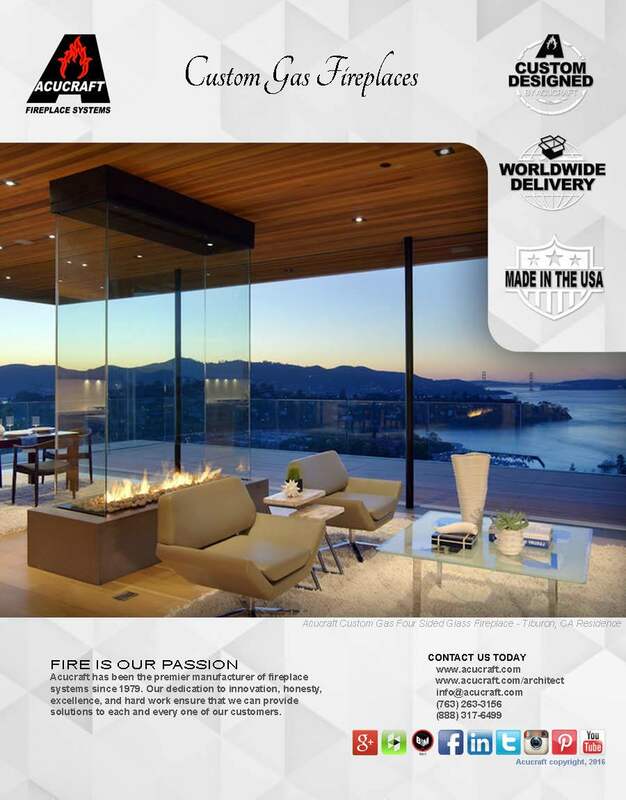 Acucraft is world renown for engineering and handcrafting one-of-a-kind custom fireplace systems with the tallest, safest, most beautiful flames on the market for over 39 years. Minneapolis, Minnesota is hosting the AIA MN Conference of Architecture November 13-16, 2018. If you plan to attend, join Acucraft Fireplace Advisors for candid collaboration in the Exhibit Hall booth #809. Bring your fire design ideas and leave knowing you’ve found a partner who can make your fire designs come to life! 4-6PM: Live Music, FREE Surly Furious Craft Beer at the Acucraft Fireplace Systems booth #809. Talk with knowledgeable Acucraft Fireplace Advisors about your design ideas. 11:15AM–2:30PM: Talk with knowledgeable Acucraft Fireplace Advisors about your design ideas at the Acucraft Fireplace Systems booth #809. 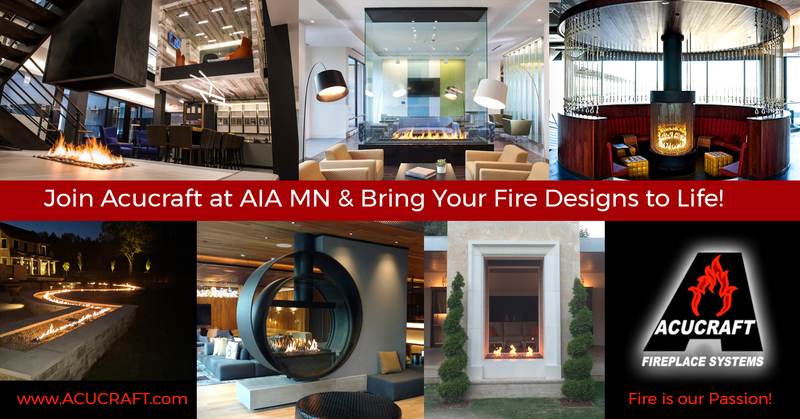 3:45-6PM: Talk with knowledgeable Acucraft Fireplace Advisors about your design ideas. 11:30AM–2PM: Talk with knowledgeable Acucraft Fireplace Advisors about your design ideas at the Acucraft Fireplace Systems booth #809. If you’re not attending the AIA MN on Architecture Conference you can still get your FREE Exhibit Hall Pass at the AIA MN Registration Desk, Minneapolis Convention Center, Downtown, Minneapolis, MN. Acucraft has engineered and handcrafted many one-of-a-kind custom commercial fireplace systems over the last 39 years including these shown below. None of them would have been possible without YOUR architectural design custom gas fireplace ideas! This Acucraft 4 sided, glass-on-glass custom gas fireplace showcases flames with modern transparency. This Acucraft circular fireplace provides uninterrupted, three-hundred-sixty-degrees of circular glass surrounds the tallest, safest, most beautiful flames on the market and provides stunning views anywhere in the room. This Acucraft 100-foot ribbon of flame livens outdoor patio entertaining year-round. This Acucraft indoor open fire pit adds a dramatic focal point to this corporate center. For over 39 years, Acucraft Fireplace Systems has been working direct with Architects and General Contractors to engineer and handcraft custom fireplaces to meet your design intent. If you dream it. We build it. Acucraft Fireplace Advisors and Acucraft Designers work with you one-on-one to make your fireplace design ideas a reality. Acucraft brings you the tallest, safest and most beautiful flames on the market for a lifetime of happy burning! Your safety and peace of mind is important to us! Acucraft is the first fireplace manufacturer in the world to have invested in a 3rd-Party Certification in-house test lab to ensure that your gas fireplace meets or exceeds ANSI / CSA performance and safety standards with Label by LabTest Certification, Inc. No other custom fireplace manufacturer has gone to these lengths for your safety and peace of mind. Acucraft Fireplace Systems is committed to providing you with the highest quality and safest fireplaces in the world backed by the Acucraft Lifetime Warranty. Not able to attend the AIA MN Show, request an Acucraft Custom Gas Brochure!